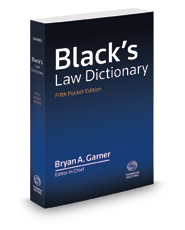 Black's Law Dictionary, Pocket Edition is the top-selling paperback law dictionary for good reason. With more than 19,000 definitions from the industry-standard Black's Law Dictionary 10th, it is an essential reference tool for legal terms in a compact format. The terms that matter most, with clear and concise definitions, are included from the legal dictionary that judges and lawyers cite more than any other. Law students, journalists, lawyers, and anyone interested in knowing the precise meaning of legal terms find this a must-have resource.